What can I Do with Old Bicycles after Christmas? What can you do with old bicycles after Christmas? Well, that really depends on their condition and your particular situation. Much like disposing of an old barbecue grill, getting rid of old bicycles can pose a big challenge. It’s not because they are unsafe, like appliances which contain hazardous materials. And, it’s not because they cannot be refurbished and reused for a new lease on life. It’s because there’s just not much demand for used bicycles. Okay, so old bicycles are a lot like dealing with old fitness equipment — they can still serve a purpose, depending on their overall condition. So, you treated yourself to a new set of bicycles for Christmas. But, you still have old bicycles and no longer want them. You couldn’t dispose of them prior to Christmas because it was part of the whole gig. After all, Santa Claus brought new bikes and he gets all the credit. Donate them to charity. Local charities really need donations before Christmas to help give others in need resources and gifts. But that doesn’t mean those same charities don’t need donations after Christmas. After all, they’ve largely depleted what they have taken in prior to the holiday so check a few local charities out. Give them new life. There’s no reason you can’t breathe new life into those old bicycles. With just a bit of common hand tools, a little bit of paint, grease, and other tools and materials, you can give them a fresh lease on life. Sell them locally. 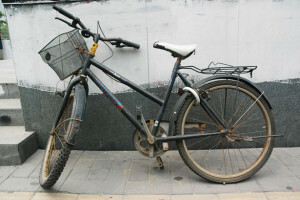 Go online and place an ad to sell those old bicycles locally. To move them out the door really fast, sell them on the cheap and you’ll be rid of them in no time flat. List them for an inexpensive price and you’ll be able to move on quickly. Junk your old bicycles. If those old bicycles aren’t in good condition or cannot be salvaged to be reused, just have a junk removal service come and pick them up and haul them away. This way, you can get rid of them, as well as anything else you no longer want. When you need to junk old bicycles and need a convenient solution, just phone 800-433-1094 or visit Junk Garbage Removal. We will go right where you need us to be and pick up whatever junk you need to get rid of right away.